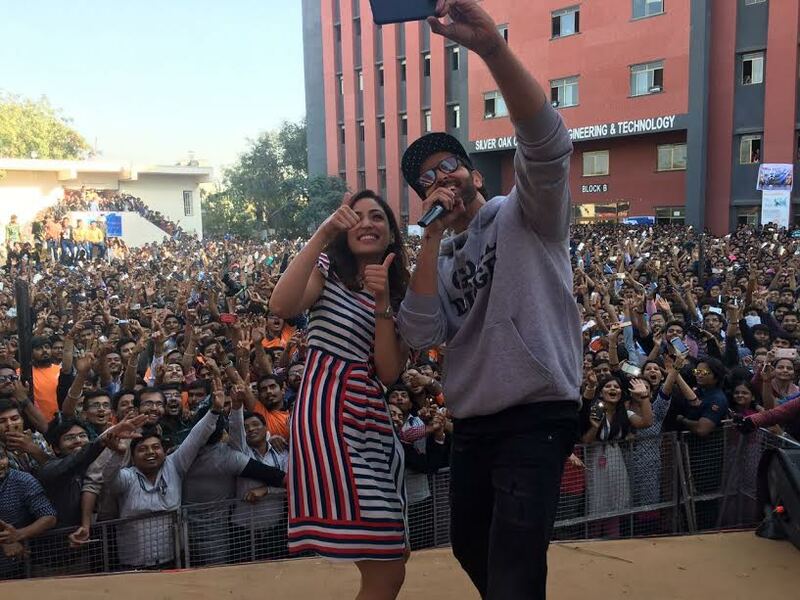 The Kaabil Team, Hrithik Roshan and Yami Gautam take Ahmedabad by storm! Hrithik Roshan and Yami Gautam are on a roll. From the promotional frenzy of their latest release Kaabil, that has garnered them rave reviews for their soul stirring performances and is also setting the Box Office on fire, they went from Mumbai to Ahmedabad to meet their fellow “Kaabilians” and fans! The students of Silver Oak College, Ahmedabad were in for a treat that Hrithik and Yami not only interacted with them, but also danced, sang and took fun Boomerang videos. Hrithik took to the mike and spoke about his love for Gujrathi food and also thanked all the students by saying that, “Because of you, we are Kaabil. Without you, we are nothing. I really do not know what this magic is but I do know that I want to jump right now and give you all a very very big hug!” Thousands of students went crazy on seeing their Kaabil Jodi come alive to the title track Kaabil Hoon and Mon Amour. Videos and Images for the same are duly attached with this email! Rakesh Roshan’s Kaabil starring Hrithik Roshan and Yami Gautam, directed by Sanjay Gupta released on Wednesday, 25th Jan, 2017.